My main interest is focused on how eukaryotic DNA is packaged and organised within the cell. In particular, I am interested in how the core histones are assembled into nucleosomes to create a platform for higher order chromatin structure. 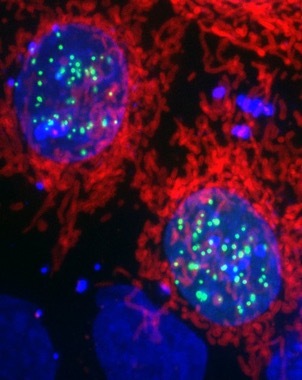 As many nuclear processes require access to the genome to exert their function, such as transcription, DNA replication & DNA repair, correct assembly and disassembly of chromatin structure is imperative for proper cellular function. Whilst a building is made of many different materials, such as bricks, mortar, steel and glass, it is very much more that a sum of its parts. Each component has to be fabricated and placed at a defined location at a specific time in order to produce a functional structure. Similarly, a genome has multiple components, such as DNA (the genetic blueprint), proteins and RNA, all of which have to be synthesised and assembled according to very precise guidelines. My research focuses on how core components of the genome – called histones – are assembled onto DNA to create the basal level of genome organisation called ‘chromatin’. Until now it has been difficult to observe the assembly process as it occurs in cells, and we have had to base much of our hypotheses on observing the end product. This is like trying to understand the internal architecture of a building by looking at it from the outside - it would be much more informative to have a time-lapse video showing all the different stages of construction. My aim is to develop methods so that we can see the individual stages of chromatin construction as they occur in the cell. Studying such dynamic processes as they happen is important as dynamic rearrangements in chromatin structure and composition underlie numerous pathological conditions and govern responses to developmental and environmental cues. Key to the chromatin assembly process is a set of histone specific chaperoning proteins that govern histone folding, storage and incorporation into chromatin. These are very dynamic processes, with histones being incorporated into chromatin within minutes of being synthesised in the cytoplasm. During this time it is thought that histones are transferred between a number of different chaperoning and histone modifying proteins in a maturation process that produces deposition-competent histones. I am interested in observing such transitions in living cells using the core histone H3 and H4 as models for chromatin assembly. 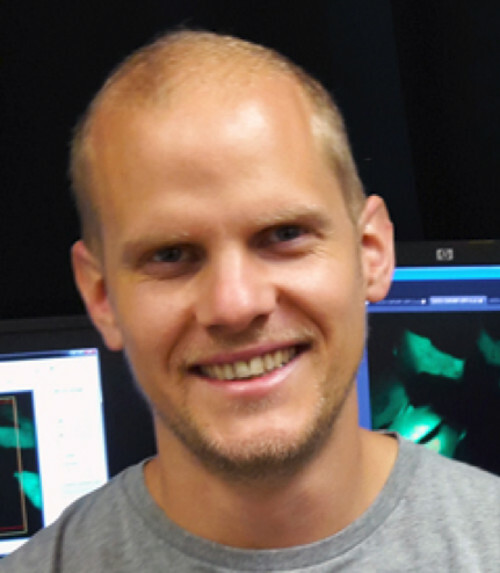 In order to visualise and quantify such dynamic behaviour in living cells I am developing methods that interface synthetic biology and protein engineering tools with state of the art live cell imaging approaches. It is hoped that being able to visualise these processes in real-time will broaden our understanding of one of the most fundament processes in chromatin biology. Bowman A, Lercher L, Singh HR, Zinne D, Timinszky G, Carlomagno T3 Ladurner AG. (2016). "The histone chaperone sNASP binds a conserved peptide motif within the globular core of histone H3 through its TPR repeats." Nucleic Acids Res 44(7):3105-17. Bowman, A., C. M. Hammond, A. Stirling, R. Ward, W. Shang, H. El-Mkami, D. A. Robinson, D. I. Svergun, D. G. Norman and T. Owen-Hughes (2014). "The histone chaperones Vps75 and Nap1 form ring-like, tetrameric structures in solution." Nucleic Acids Res 42(9): 6038-6051. Hondele, M., T. Stuwe, M. Hassler, F. Halbach, A. Bowman, E. T. Zhang, B. Nijmeijer, C. Kotthoff, V. Rybin, S. Amlacher, E. Hurt and A. G. Ladurner (2013). 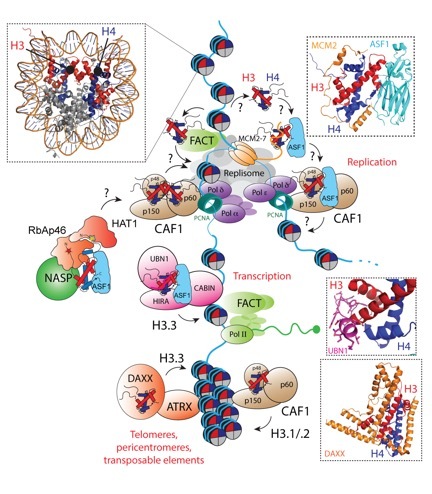 "Structural basis of histone H2A-H2B recognition by the essential chaperone FACT." Nature 499(7456): 111-114. Bowman, A. and T. Owen-Hughes (2012). "Sulfyhydryl-reactive site-directed cross-linking as a method for probing the tetrameric structure of histones H3 and H4." Methods Mol Biol 833: 373-387. Bowman, A., R. Ward, N. Wiechens, V. Singh, H. El-Mkami, D. G. Norman and T. Owen-Hughes (2011). "The histone chaperones Nap1 and Vps75 bind histones H3 and H4 in a tetrameric conformation." Mol Cell 41(4): 398-408. Bowman, A., R. Ward, H. El-Mkami, T. Owen-Hughes and D. G. Norman (2010). "Probing the (H3-H4)2 histone tetramer structure using pulsed EPR spectroscopy combined with site-directed spin labelling." Nucleic Acids Res 38(2): 695-707.